Distal Radius Fractures (fractures of the large bone of the wrist) are the most common fracture in the entire human body. Distal Radius Fractures come in many different types and patterns, which are all treated differently. Despite the fact that some physicians believe that ‘they all do well’, Distal Radius Fractures are probably the most treacherous fracture in the entire arm. This overly optimistic belief originated in a paper written by Abraham Colles in 1814, about 80 years before X-rays were invented. Suffice it to say that it’s an outdated point of view. The truth is that if Distal Radius Fractures heal in poor position, they commonly lead to wrist pain, arthritis, stiffness and loss of function. In addition, as the wrist is the foundation of the hand, if the wrist heals in poor position the fingers may become stiff and hand function may also be compromised. Many patients whose distal radius healed in poor position have required multiple surgeries to correct the deformity and to release the fingers to regain motion. If a Distal Radius Fracture is minimally-displaced (hasn’t moved significantly), it’s treated in a short-arm cast for 5 weeks. If the Distal Radius Fracture has a stable pattern, but is displaced (i.e. the fragments have moved), an attempt at ‘setting the fracture’ (closed reduction) may be attempted in the office. This is currently done less commonly than it used to be, because most fractures that are displaced are unstable do much better if surgically stabilized. However, some fractures can be treated this way. If so, following closed reduction, follow-up radiographs are obtained every week for three weeks to make sure that the fracture doesn’t fall back into an unacceptable position, which unfortunately happens fairly frequently. Distal Radius Fractures with unstable patterns do better with surgical stabilization. It is important that the Distal Radius heals in a position that is close to normal. As noted above, if the distal radius is allowed to heal in poor position, stiffness, pain, and decreased ability to use the hand are common. If the Distal Radius Fracture goes into the joint, leading to a ‘step-off’of the joint surface, this requires surgery to restore the anatomy to as normal as can be obtained and hopefully to prevent arthritis. In these cases a CT (cat) scan is usually obtained to further define the injury and plan the surgery. If a Distal Radius Fracture heals with just a 1 mm step-off in the joint, arthritis will occur in 90% of cases. If surgery decreases the step-off to <1 mm, the chance of developing arthritis falls to about 10%. If the step-off is 2 mm or more, the chance of developing arthritis is close to 100%. 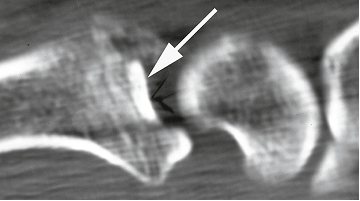 CT Scan Showing the Intra-Articular Depression (Step-Off) of the Central Wrist Joint (arrow). Older forms of fixation, such as pins and external fixation, have a high complication rate and often allow the fracture to collapse back into poor position after they are removed. 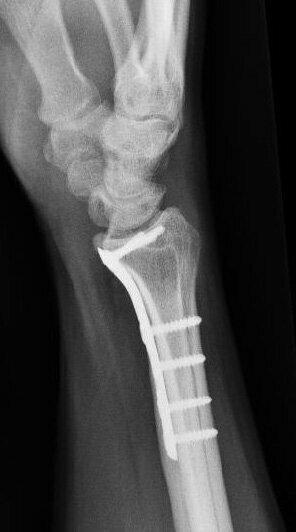 Although the fracture may have initially been placed into an acceptable position, if it collapses and ultimately heals an unacceptable position, hand and wrist function will be compromised. Newer ‘locking’ plates placed on the palmar side of the wrist have screws that lock securely into the plate, providing long-lasting rigid fixation that allows for earlier motion and a quicker return to function. With the distal radius held firmly in a good position, hand use is encouraged to minimize stiffness and dysfunction. In most cases, the arm is only splinted for a week after surgery, after which time showering is allowed and a hand therapy is initiated to regain motion. In patients with significant osteoporosis, motion may be delayed until 2-4 weeks after surgery. Distal Radius Fractures are often associated with ligament injuries. If these ligament injuries are obvious, they’ll be fixed at the time of surgery. However, many times the ligament injuries are subtle. In many of these cases, the ligaments heal with the fracture and don’t cause problems. 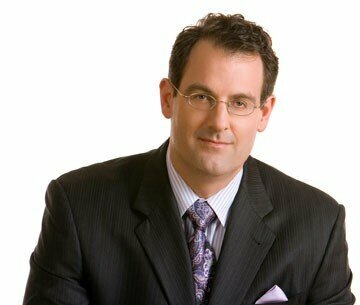 If a ligament injury causes problems later, it can be treated later. Many General Orthopedic surgeons operate on Distal Radius Fractures. While some may do good work, they are not sub-specialist Hand Surgeons, who are the true experts when it comes to wrist injuries, including Distal Radius Fractures. Some of the most miserable patients I see have had their Distal Radius Fractures fixed by non-specialists who think that these fractures are all simple ‘Colles’ fractures that ‘all do great’. Unfortunately, many of them don’t. While re-breaking the fracture is possible (please see the ‘Distal Radius Malunions’ section of this website) it’s far easier to do the surgery right the first time. This may avoid the necessity for multiple surgeries to obtain the function that could have been obtained had the patient simply had a Hand Surgeon fix their wrist correctly in the first place.